Learn about the objective of Canada’s monetary policy and the main instruments used to implement it: the inflation-control target and the flexible exchange rate. See also how monetary policy works, how decisions are made and related backgrounders. The objective of monetary policy is to preserve the value of money by keeping inflation low, stable and predictable. This allows Canadians to make spending and investment decisions with more confidence, encourages longer-term investment in Canada's economy, and contributes to sustained job creation and greater productivity. This in turn leads to improvements in our standard of living. Canada’s monetary policy framework consists of two key components that work together: the inflation-control target and the flexible exchange rate. 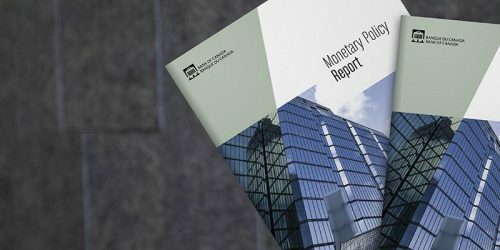 This framework helps make monetary policy actions readily understandable, and enables the Bank to demonstrate its accountability to Canadians. At the heart of Canada’s monetary policy framework is the inflation-control target, which is two per cent, the midpoint of a 1 to 3 per cent target range. First introduced in 1991, the target is set jointly by the Bank of Canada and the federal government and reviewed every five years. However, the day-to-day conduct of monetary policy is the responsibility of the Bank’s Governing Council. The inflation-control target guides the Bank’s decisions on the appropriate setting for the policy interest rate, which is aimed at maintaining a stable price environment over the medium term. The Bank announces its policy rate settings on fixed announcement dates eight times a year. The target for the overnight rate, also known as the key policy interest rate, is the interest rate that the Bank expects to be used in financial markets for one-day (or "overnight") loans between financial institutions. This key rate serves as the benchmark that banks and other financial institutions use to set interest rates for consumer loans, mortgages and other forms of lending. To achieve the inflation target, the Bank adjusts (raises or lowers) its key policy rate. If inflation is above target, the Bank may raise the policy rate. Doing so encourages financial institutions to increase interest rates on their loans and mortgages, discouraging borrowing and spending and thereby easing the upward pressure on prices. If inflation is below target, the Bank may lower the policy rate to encourage financial institutions to, in turn, lower interest rates on their loans and mortgages and stimulate economic activity. In other words, the Bank is equally concerned about inflation rising above or falling below the target. Such an approach guards against both high inflation and persistent deflation. Monetary policy actions take time - usually between six and eight quarters - to work their way through the economy and have their full effect on inflation. For this reason, monetary policy is always forward looking and the policy rate setting is based on the Bank’s judgment of where inflation is likely to be in the future, not what it is today. Canada’s flexible exchange rate, or floating dollar, permits us to pursue an independent monetary policy that is best suited to Canada’s economic circumstances and is focused on achieving the inflation target. Movements in the exchange rate also provide a “buffer,” helping our economy to absorb and adjust to external and internal shocks. A backgrounder explaining the role of the exchange rate in Canada's economy. Governor Stephen S. Poloz discusses the role of a floating exchange rate in the Canadian economy and in the Bank’s monetary policy framework. 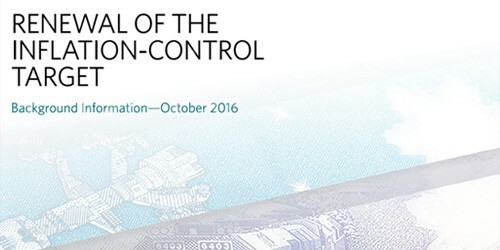 Find out when decisions are made, who decides and the key stages of monetary policy decision making. You can also read detailed articles on the subject. Commentary and technical data relating to the 2016 target renewal. Defines this important policy interest rate and describes the role it plays in influencing various market interest rates. Explains what the Bank Rate is and its relationship to the target for the overnight rate. Outlines the factors that affect interest rates for commercial loans. Explains the process by which changes in the policy interest rate work their way through the economy and ultimately affect the rate of inflation. Explains the purpose of monetary policy and describes how it works. Commentary and technical data relating to the 2011 target renewal. 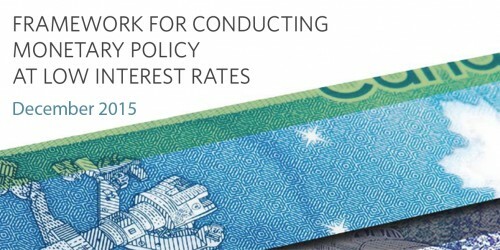 This document outlines a series of monetary policy measures that could be deployed in a very low interest rate environment.